General Motors is ramping up the production of its all-electric, autonomous Chevy Bolts. In fact, the company has announced it recently completed production on an additional 130 more self-driving Bolts at its Orion assembly plant in Michigan. The new vehicles feature updated self-driving tech which comes courtesy of GM’s collaboration with San Francisco-based autonomous vehicle startup, Cruise Automation. Soon, they will be unleashes on the roads of San Francisco, Scottsdale, and Detroit. 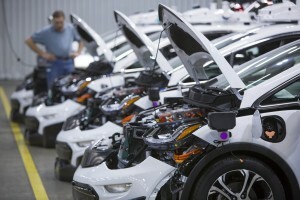 Ever since acquiring Cruise Automation, GM has been steadily unveiling more and more about its self-driving fleet, from the sensors the vehicles are outfitted with to LIDAR and cameras. Expect GM to begin rolling out more and more all-electric, autonomous Chevy Bolts moving forward.